It is important to have a large population of honey bees in place to take advantage of a major nectar flow. An early summer inspection of the bee hives found most strong and ready for collecting nectar from the blooms of the Arkansas Delta’s flowering row crops. The primary two crops for honey bees to use to make honey are soybeans and cotton. 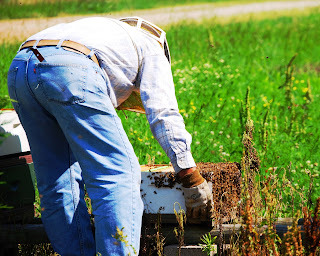 When inspecting the bees, we expect to find hives that are full of healthy bees. We can assume that we have a good queen by examining the frames in the brood area. We should find brood of all stages: eggs, larvae, and pupae. Under normal conditions, there will be roughly twice as many larvae as eggs and twice as many pupae as larvae. This distribution of brood stages results from the time that the brood exists in each stage of development: three days for eggs, six days for larvae, and 12 days for pupae. 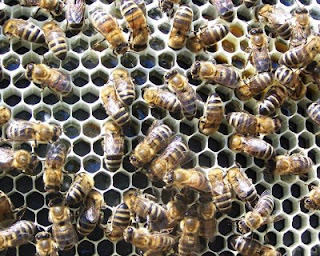 The pattern of the capped brood, which contains the pupae, tells us much about the queen and the health and condition of the hive. Click on the picture to see a healthy frame of capped brood from a strong colony. The light brown colored cappings extend across the entire frame in a continuous pattern with very few empty cells. Those empty cells probably indicate that we have a colony that has the ability to detect and remove parasitic mites growing in the brood cells with the developing larvae. The bees uncap the affected cell, remove the larva and the mites, and carry them out of the hive. This genetically-passed trait is called hygienic behavior. Using genetically mite-resistant bees with hygienic behavior is one of the key components of our integrated pest management program. With the change of seasons we find a change in the wildflowers coloring the undisturbed margins of fields and woodlots. The yellow, white, and purple flowers of spring have been replaced by different yellow flowers plus reds and whites. 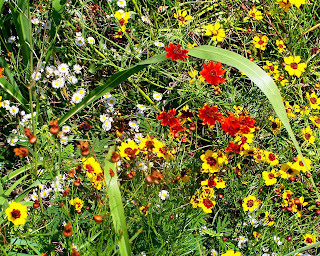 Among coffee weed and spires of Johnson grass, an overgrown ditch bank reveals several bright and colorful varieties of coreopsis plus white and yellow summer asters. Here at Peace Bee Farm, we collect and freeze pollen in the summer to feed to the bees next spring to ensure a good variety of nutrients at queen-raising time. We can tell that there are numerous pollen sources available just by observing the collected pollen. The color and taste of the pollen pellets changes almost daily. This summer diversity of proteins, lipids, vitamins, and minerals will be most valuable in the early spring when pollen is not abundant. A group of home school students from northern Mississippi visited the bee farm today. The students have been studying entomology along with their parents. Again and again I am impressed by the understanding that young children have of their natural world. They ask the most pertinent questions. They came to the bee farm with considerable knowledge of insect and honey bee biology. They asked how bees find flowers, how they know when they need a new queen, and how they go about raising a new queen. Both the children and their parents were eager to discuss ways of introducing a new queen to a colony. They could foresee many of the problems of queen acceptance. Honey bees fascinate people of all ages and open their imaginations. While examining bee hives, I found one colony in need of a new queen. Every hive needs a healthy and productive queen. Without a highly productive queen a colony cannot grow to the size necessary to produce a surplus of honey or effectively pollinate crops. Honey bees never help out other colonies that are in trouble, but beekeepers regularly do. I looked in a nearby hive for a frame of young brood to borrow and add to the weak hive. I hoped to find brood at the youngest larval stage that the bees could use to raise a new queen. On day four of development, honey bees can create a queen bee by feeding the larva a diet of royal jelly. However, I couldn’t find any brood of the proper age. With a strong nectar flow, the hive had become honey-bound; all available cells were filled with honey. The bees filled cells that the queen would normally use for egg laying with incoming nectar, a common occurrence this year. I did find a fully developed queen cell on a frame, which I decided to move to the colony in need of a new queen. A colony will usually accept any queen that emerges in its hive. After carrying the frame by hand a short distance to the new hive, I gave the queen cell a final inspection. The cell was empty; the queen had emerged while I held the frame in my hands. Click on the picture to see a new queen, one minute old. The hair on her body still appears wet. On the frame from the honey-bound hive she walks past cells of capped brood on the left. The cells of recently emerged bees have been immediately filled with honey. The darker area to the right of the queen is fully-ripened honey in cells capped with beeswax. Pure sumac honey has a golden color. When it is fresh it has a bitter taste. However the bitterness disappears by winter. 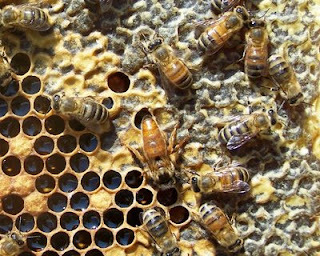 The mixing of various nectar sources in a hive’s honey stores makes for distinctive flavors. As is the case with sumac honey, the taste of the honey may change over time as well as from season to season. There is very little single-source honey; most honey comes from dozens of different nectar sources. Sumac is a major honey plant. It is, by the way, in the same family as poison ivy and poison oak, two lesser honey plants, which do make good, edible honey. The honey bee builds its own nest out of beeswax that the young bees secrete from glands on the lower side of their abdomen. Flakes of beeswax are secreted after the bees eat honey. For the bees to produce an ounce of beeswax, they must consume one pound of honey. For the bees to produce that pound of honey they must fly a combined distance of 55 thousand miles and visit two million flowers. That distance is more than twice the distance around the world at the equator. To accomplish the building of the brood nest, it is necessary to have a significant nectar flow from the flowering plants surrounding the bee hive. Some of the honey bee colonies that we started in the spring have expanded their brood nest to fill two medium-size hive boxes and are now building the honey comb to occupy a third box. If you click on the picture, you can see the bees in the process of drawing out the beeswax to make the six-sided honey comb cells. The bees work together to fashion the flakes of beeswax into cells by starting at the top frame bar and working their way downward. In the picture, you can see bees in the lower half of the frame manipulating beeswax to draw out the comb. The beeswax of new honey comb is bright and white. The bees in the upper half of the frame are filling the newly completed cells with honey. Here, we see a strong colony drawing out perfect frames of honey comb during a good nectar flow. Throughout the spring, summer, and fall there is a progression of yellow wildflowers. Coming into bloom now is tickseed coreopsis, a member of the important bee plant family, the composites. Tickseed coreopsis has bright yellow petals surrounding a reddish-brown center. The composites are the sunflowers. The composites are among the largest families of flowering plants, making up one tenth of the world’s plant species. There are 25 thousand composites, including dandelion, chicory, lettuce, and chrysanthemum. They contribute both nectar and pollen to the honey bees. 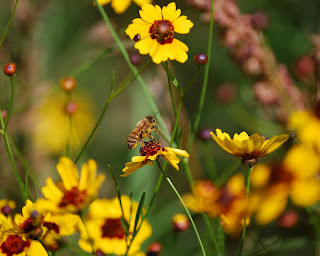 It seems that the honey bees in the Arkansas Delta use coreopsis primarily as a source of pollen. A diverse number of pollen sources are important for good honey bee nutrition. Click on the photo to see the honey bee with pollen covering its legs and hairy body. The bee will rake the pollen from its body, mix it with some honey from her honey gut, and pack it on her pollen baskets on her hind legs. She will then be ready to fly back to her hive. There will not be another yellow flower in place in great numbers until the coreopsis has completed its colorful showing. Not only have the flowering plants evolved with attracting schemes of color, shape, infrared nectar guides, fragrance, and taste for the pollinators, they also have a time-sharing scheme to help insure their pollination. By not competing with other yellow flowers at this time of year, the coreopsis helps insure its pollination and seed production for next year’s plants. 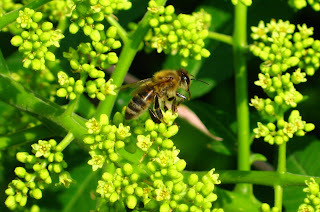 The honey bees and flowering plants have always benefited each other. Honey bees bring four things into the hive: nectar, pollen, water, and propolis. Propolis is sometimes called bee glue. Honey bees collect the saps and gums of trees to make propolis. Propolis is a sticky substance with the texture of chewing gum found on the sole of your shoe. The bees use it to glue together everything in the bee hive. It is the reason that beekeepers use a hive tool to open the hive and remove the frames. The bees use propolis to seal every crack in the hive. When they first move into a hive or cavity, they varnish the inside surfaces with propolis, which has antibacterial and antifungal properties. As well as sealing cracks, the bees build structures with propolis to direct the flow of air through their nest. If a mouse gets into the bee hive, the bees will often sting it to death and then encase the dead body in propolis, thus protecting the hive from bacteria and odor. Propolis has a number of human uses as well. A number of medications are made from propolis. It is also applied to the surface of certain musical instruments. It is thought that Antonio Stradivari used propolis in making his violins in the late 1600s. Click on the photo to see the honey bee collecting propolis. It is a difficult task, taking considerable time. The bee gnaws at the sticky tree sap with her mandibles to free flakes which she carries in her pollen baskets. The propolis is the yellow flakes on the bee’s hind legs. 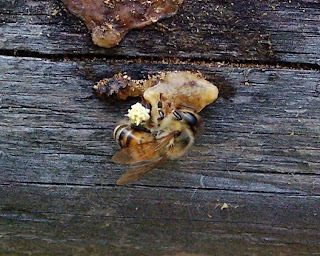 Once she returns to the hive, she will need the assistance of another bee to remove the sticky propolis from her pollen baskets. Even for the bees, propolis is almost as sticky as chewing gum. The Memphis Botanic Garden serves a number of functions in the city. It provides a relaxing and beautiful park-like atmosphere for groups and individuals to meet. The area includes a number of gardens including a rose garden, a sensory garden, a butterfly garden, a Japanese garden, several water gardens, an urban orchard, and even a prehistoric garden Trails course through exotic and native plantings as well as through daffodils, herbs, conifers, and a cactus collection. Horticulturalists tend to plants in a variety of ecosystems and designed gardens. They propagate plants in greenhouses. Peace Bee Farm maintains a bee yard on the grounds of the Memphis Botanic Garden for pollination and for education. The Memphis Botanic Garden’s web site is: http://www.memphisbotanicgarden.com/. They conduct educational programs that address people of all ages. Along with others, we participated in an imaginative educational program for small children. As the children and their parents passed along the Memphis Botanic Garden trails, they stopped at various stations for exploration. 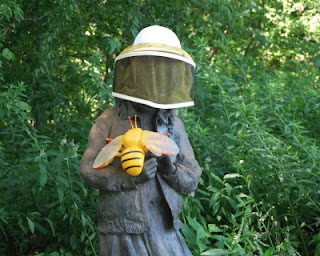 At our station, located near a bronze statue wearing a beekeeper’s veil, the children got an opportunity to don a beekeeper’s suit and look into a bee hive. No, there were not bees in it. The parents and grandparents accompanying the children had many question about the bees. Many were quite knowledgeable of the shortage of honey bees. They know of the importance of honey bees and native pollinators. Botanic gardens are important; they enhance our lives and help protect the plants. We should visit and support botanic gardens. Throughout southern landscapes we find magnificent magnolia trees in bloom. These native trees of the Deep South are favored in lawns for the dark green, waxy leaves and large, fragrant blossoms. 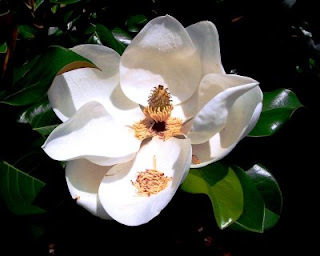 At times, magnolias escape cultivation and can be found in woodlots. The magnolia family contains a number of flowering magnolia trees as well as the important bee plant, the tuliptree, or yellow poplar. When we examine magnolia blossoms, we see that they contain large amounts of pollen. Pollen is important for the diet of honey bees in that it provides protein as well as fats, vitamins, and minerals. After pollination, the magnolia produces seed contained in a red berry, a favorite of a number of song birds and squirrels. The honey bee plays an important role in providing food for wildlife by pollinating flowering plants. Honey bees are wild animals. If we, as beekeepers, forget this, we will soon be reminded. The honey bee has been around for millions of years, and it has been managed by humans for at least seven thousand years. It is, however, quite close to its ancient nature. Most aspects of honey bee behavior evolved to make the bee more survivable in an ever changing wild environment. Living in bee hives owned by beekeepers is only a recent luxury for this ancient insect. Beekeepers do try to have some control over the honey bee by selecting queen and drone bees from colonies having desirable traits. This selection of genetic traits to be passed along to offspring helps us regulate some of the colony’s behavior. The selection also helps us avoid certain bee diseases. Still, honey bees are not domesticated. 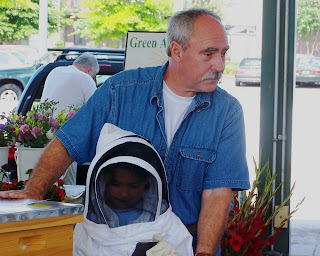 Tim Hagerty is a new beekeeper. He called me about a swarm of honey bees that was clustered on an iron pipe in an alley between two downtown Memphis hospitals. This looked like an easy swarm removal. The bees were so close to the ground that we could place a hive on the ground and brush the bees off the pipe into the hive. I sprayed some sugar water flavored with spearmint and lemon grass onto the bees to help calm them. Next, I readied the hive. This took only a couple minutes. Then, along came the diesel trucks, slowly backing down the alley. Before we could brush the bees into the hive, the bees took to flight. The swarming bees followed the cab of one of the trucks until it stopped at a loading dock. I took this picture as the bees flew away. We noticed a small remnant of the bees remained on the iron pipe. I found the queen and caged her. The swarm assembled on a sealed, third story window of the hospital. The swarm clearly appeared to be attracted to the moving truck. Maybe carbon dioxide from the exhaust pipes was the attractant. I introduced the queen to a queenless nucleus hive. The next morning, the swarm relocated itself to a tree limb at the other hospital. Tim combined those bees with a growing colony using a newspaper to slow the introduction. The hospital employees enjoyed seeing all of the activity. Tim and I learned that the wild bees don’t always behave as we intend. A series of severe thunderstorms moved through the Mid-South. Strong winds broke limbs and brought down trees across the region. Memphis’ older neighborhoods with their mature oaks showed the effect of the storms. A large red oak located only feet from our bee hives in the Memphis Botanic Garden snapped in two at a point about 20 feet above the ground. 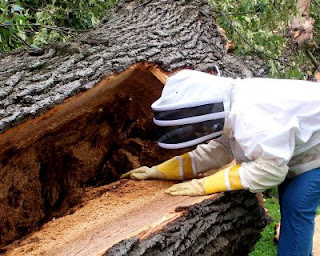 The large section of tree that crashed to the ground revealed the tree had a large cavity which served as the home for a colony of feral honey bees. A cavity in a hollow tree is the natural home for the honey bee. Our modern bee hives are designed to match the characteristics of hollow trees. The hives are made of wood, and they contain frames designed to hold honey comb in the exact spacing of parallel sheets as exist in natural honey bee nests. The entrance to modern hives is at the bottom. The entrance to natural honey bee nests in hollow trees is often in the lower part of the cavity. The bees entered this large oak tree through a knot hole, the result of an earlier storm’s damage. Our screened bottom boards used as part of an integrated pest management program are actually designed to serve as open cavity space below the honey bee nest. Parasitic mites in natural cavity nests fall into the empty cavity space below the brood nest where they are eaten by ants; when mites fall through screened bottom boards, they fall to the ground where they are likewise eaten by ants. In the photo, Rita peers into the cavity housing the feral honey bee colony. The tree held the fragrant odor of beeswax and honey. Thunderstorms with wind and lightning are continuously damaging the large trees. The damage results in an abundance of natural honey bee tree cavities. This was the second massive oak to fall close to our bee hives within a year. 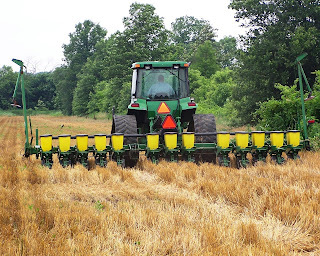 It’s planting time in the Arkansas Delta. Cotton, soybeans, rice, grain sorghum (milo), and corn are planted in large tracts. For the honey bee, the rice, grain sorghum, and corn don’t provide food. They are grasses, which are wind pollinated. The cotton and soybeans, however, are flowering plants; and they provide ample forage for the honey bees. They are the greatest nectar sources in the Delta. From these major Delta row crops the honey bees produce mild-flavored, light amber colored honey. For success in producing a crop of honey from cotton and soybeans, the beekeeper must encourage the bees to produce large populations of foraging workers prior to bloom time. If the bee population is not large enough at the start of the flower blooms, the bee colonies will grow through the relatively short bloom time without producing any surplus of honey that can be harvested. Our most productive hives will be full of bees at this time of the year. We try to maintain hives with approximately 60 thousand bees. Only healthy colonies with productive queens reach this effective population. In the photo, you can see a farmer planting his grain crop near one of our bee yards. It will not be long before the seeds have emerged and the plants have grown to the point that they are blooming and attracting honey bees. This is a good example of the practice of no-till agriculture. Seed is planted directly into the stubble of winter wheat that was harvested the previous day. The ground is not plowed. Weeds are controlled by the use of the wheat straw mulch. Not disturbing the soil helps prevent weed growth. Weeds that do emerge are controlled by chemical herbicides. Click on the photo above for a close-up view of no-till planting. You can see that this field has a pollinator-friendly margin of foliage. Native bees can thrive in this margin. One of the Memphis Farmers Market’s goals is to educate the public about foods and the way they are produced. Each week the market features vendors who make a presentation about some aspect of producing foods on their farm. This week, Peace Bee Farm was asked to discuss how honey is produced. The farmers market also invited a nutritionist from The University of Memphis to be available to visitors to the market. She was quite knowledgeable of the use of honey, as she had employed it in designed nutrition programs for individuals with diabetes. The audience was quite interested in how the honey bees make honey and how we remove it from the hive and handle it before bringing it to market. They were amazed at the idea that it takes the bees two million flower visits to produce one pound of honey. They greatly underestimated the combined miles of honey bee foraging flights to produce this pound of honey. It’s 55 thousand miles, more than twice the distance around the earth at the equator! Those attending the honey presentation had many questions about honey and the bees. They were most interested in cooking with honey, so I suggested that they visit the National Honey Board’s web site, http://honey.com/, for recipes and information about substituting honey for other sweeteners. The web site also gives information about adjusting the oven temperature when cooking with honey to control the browning of the foods. The audience described honey as being both tasty and healthful. There were questions about what is considered raw honey, a product in great demand. I explained that none of our honey is heated or filtered. My assistant smoking the training hive is Samantha, who came to the market with her family. She handled the smoker like a seasoned beekeeper. The Vitex, or chaste tree, is in bloom with its long, upright clusters of light blue flowers. This large shrub or small tree is a favorite for landscape plantings throughout the South. 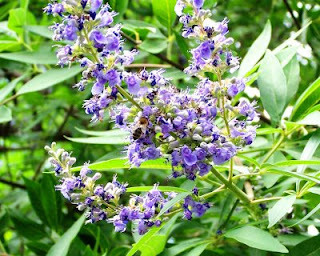 Like the honeybee, Vitex was brought to America by the colonists. Vitex is especially appreciated by beekeepers and those who want to attract insect pollinators. Vitex is very attractive to a number of species of bees and native insect pollinators, and it blooms over a long period of time. During the summer months, Vitex is one of the few plants available in some areas during times of dearth when other plants are not producing nectar. I met Karen and Steve Cantor while I was snapping pictures of their Vitex tree in the lawn of their Midtown Memphis home. Click on the picture, and you can see a honeybee collecting nectar from the delicate flowers of the Vitex. At the time, the tree was being worked heavily by carpenter bees. They are the large bees that look like bumblebees, except they have a shiny black abdomen. A few honeybees and solitary bees were also foraging on the Vitex as well. Their lawn was in bloom with a number of flowering plants. The Cantors are true stewards of the environment. They also plant a number of different varieties of sunflowers. Such plantings provide a continuous supply of food and habitat for the pollinators as well as diversity of pollens for good nutrition for the developing bees. We talked briefly; the Cantors are quite knowledgeable of our impact on the environment. I had a few supers of honey that I had just harvested from our bees at the Memphis Botanic Garden, so we shared a taste of some light and flavorful spring honey. I thank the Cantors for using their landscaping efforts to create a beautiful lawn and a feeding area for the bees. There is a considerable interest among many for us to return to foods produced locally as opposed to those readily available in grocery stores. These foods may have been imported from great distances. People are attracted to local foods because they may be fresher, more flavorful, or more healthful. More varieties of produce may be available, such as delicious, but fragile, heirloom tomatoes. In many cases local production of food is favored as a means of supporting the local agriculture and economy. Each of these incentives combines to make farmers markets increasingly attractive. Local chefs arrive early to shop for fresh produce to include in the day’s menu. They know that not only is the produce fresh, it is fully mature or ripened. Varieties not available in groceries can be found in farmers markets. The first time I talked to Melissa Peterson was when news stories broke regarding the mysterious disappearance of honey bees, now called Colony Collapse Disorder. She called from Portland, Oregon. Minutes later, I was interviewed by news media from Savannah, Georgia and in the Mid-West. With coast to coast media coverage, I kidded Rita that I might have to get an agent. Melissa Peterson, the editor of Edible Memphis magazine, is one of the energetic and effective voices supporting the move toward local foods in Memphis and the Mid-South. Her quarterly magazine approaches foods of the region in each of the seasons. She helps build ties between restaurants, chefs, bakers, farmers, and those who merely enjoy food. Melissa is an advocate for the slow food movement. Yes, that’s the opposite of fast food. In The University of Memphis’ continuing education program Melissa teaches interested cooks how to properly use their chef’s knife. 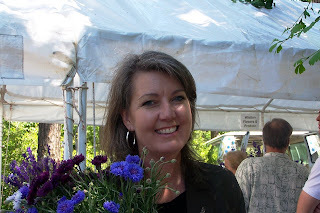 She is a regular, friendly face at local farmers markets, and she always has with her a basket of fresh produce or a bouquet flowers. A subscription to Edible Memphis, with its colorful photography and articles can be obtained at: http://www.ediblememphis.com/. I enjoy reading it; Melissa is a pleasure to have around. The honey bee colony regulates the temperature in its nest to protect the developing brood. Whenever the bees are producing young, they maintain a temperature of 95 degrees inside the hive. In cool weather, the bees cluster together and generate heat by consuming their high energy food, honey, and vibrating their flight muscles. In warm weather, like we are experiencing now, the bees must cool the hive. They do this by first expanding the distance between bees in the nest to allow for air circulation. If there are too many bees in the hive, some merely move outside and cling to the outside of the hive or festoon down from the landing board. The bees inside the hive actively cool the nest by bringing in water from outside sources and fanning their wings across a droplet of water. The evaporating water cools the hive. A hot, humid afternoon found the bees actively cooling the hives. Click on the picture to see the bees aligned in an orderly arrangement to carry the air out the entrance, which is at the bottom. Other bees are aligned head-down to carry heat away from the entrance. The honey bee colony is effective in regulating the temperature of its nest. 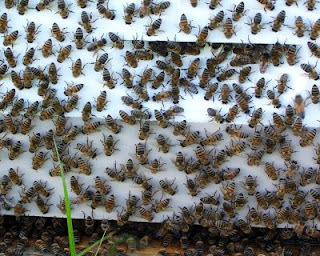 During the dead of winter, when the queen is not producing brood, the bees don’t waste energy heating the hive to 95 degrees; they only warm the cluster of bees to about 70 degrees. They also conserve energy by not trying to warm the entire hive cavity, just the cluster of bees. 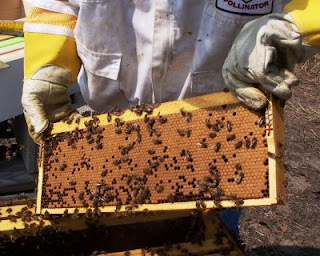 For cooling the hive, the bees devote a number of workers to fanning tasks. When the summer temperatures rise into the high 90s, the bees stop their normal activities and begin foraging for water. Bees foraging for pollen and nectar will redirect their efforts to bringing water back to the hive. With the major nectar flows in the Arkansas Delta approaching, the bee hives are full of bees. The Arkansas Master Gardeners held their annual convention in West Memphis. About 500 Master Gardeners from across the state gathered in this Delta city located on the Mississippi River levee. I was honored to be asked to speak at the convention. My presentation involved bees and the environment, a topic that I feel greatly affects us all. The more we get to understand the relationship between the pollinators and humans, the better we can protect these important creatures. I explained the role of honey bees and the native pollinators in producing one third of our diet by pollinating our crops. I also mentioned that there is a decline in the numbers of all of the pollinators, bees, other insects, birds, and bats. I encouraged the Master Gardeners to continue to act as advocates for the prudent use of chemical fertilizers, herbicides, and pesticides. I encouraged them to continue using integrated pest management techniques in the garden and to avoid broad-spectrum insecticides. I especially cautioned these masters to prevent the formation of environmental niches which will be filled by pests. We see these niches being formed when beneficial insects are killed off, often by indiscriminate spraying of pesticides. This well-informed audience of Master Gardeners asked about the effects of the systemic insecticides on the bees. I explained that these new nerve toxins are still suspect as contributing to the decline in honey bees around the world. I encouraged all to contribute to the solution to the loss of pollinators be creating their own pollinator garden. These are simple plots of ground planted without the use of chemicals that injure or kill the important insects. They may be back-yard vegetable gardens, herb gardens, flower gardens, window boxes, or merely landscape plantings. 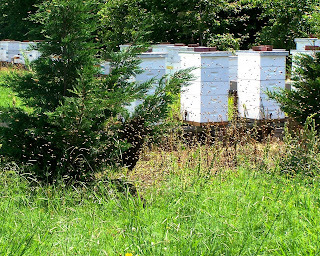 In today’s photo, I am placing a swarm of honey bees on a stand in the bee yard. These are the same bees that were shown swarming in yesterday’s posting. The bees cover the sides of the hive body. Following the pheromones of their queen, the bees soon migrated into the box and down the frames. Within minutes, the colony was established in its new hive. When honey bees swarm, it is an amazing sight. Thousands of bees fly around in a circling mass, evenly spaced. How do they avoid mid-air collisions? The bees fly quietly for several minutes then coalesce in a cluster hanging onto some convenient object. They often hang on a tree limb or bush, but they may light on a mail box or house. The honey bee’s six legs each have two hooks that the bees can use to hold onto their colony mates. This allows them to form a cluster, often the size of a pineapple or larger. While these thousands of bees are in the air, bees from surrounding colonies go about their foraging seemingly ignoring the swarm activity. The swarm event starts and ends rather abruptly and orderly. 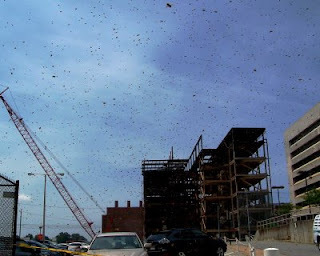 While impressive, if the swarming involves bees leaving one of your own hives, it is somewhat disappointing, however. If you don’t catch the bees, it amounts to a year’s investment lost and no prospects for a honey crop this year from this hive. I was heading to one of our bee yards with specific plans of what I intended to do with the bees when I encountered this swarm of bees in the air. By the time that I could gather a spare bee hive, the bees were conveniently festooned on a low branch of an evergreen windbreak near the bee yard. In the picture you can see the swarm beginning to gather together on the evergreen. It is the dark mass on the lower right branch. By the time I had the hive stand prepared to accept this new hive, the weight of the bees bent the branch to the ground. After spraying the bees with a little sugar water to wet their wings and retard their flying, I shook the entire swarm into a hive body, making this a very easy swarm catch. Thus, I accomplished a colony division within my bee yard. The bees controlled the scheduling of the event. 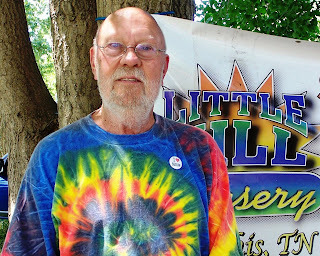 Paul Little, the owner of Little Hill Nursery of Memphis, Tennessee, is a most colorful individual. He is colorful in appearance and thought. Whenever I see him, he is wearing the bright t-shirts we wore in times past. He is also one who carries colorful ideas and brings them to pass. A knowledgeable horticulturist, Paul’s passion is growing those hearty succulents, the sedums. Paul experiments with growing these hearty plants in an attempt to find the ones best adapted to conditions in the Mid-South. He produces beautiful plantings of sedums and has become an advocate of green roofs. Green roofs are live, growing beds of plants used as the coverings of buildings. Green roofs with active plantings date back to 600 B.C. with the famous hanging gardens of Babylon. The pioneers of America’s Great Plains employed sod roofs on their huts. Memphis has recently seen its first two green roofs placed into commercial constructions. One is on a non-profit organization’s headquarters in downtown Memphis, and the other is on a doctor’s suburban office building. Paul speaks frequently to garden clubs and interested groups about green roofs. He explains that green roofs offer longer life spans, greater sound insulation, reduced heating and cooling system needs, and reduced storm-water runoff. In urban areas, green roofs can reduce the “urban heat island effect.” Green roofs are, however, more expensive than other roofing alternatives. Along with sedum potted plant arrangements, Paul often brings birdhouses, roofed with sedums and mosses, to the Farmers Market at the Memphis Botanic Garden. It’s always a pleasure to spend Wednesday afternoons with Paul at the market. This colorful and enjoyable friend was also a guitar player for the house band of Memphis’ famous Western Lounge. Now, that's colorful. Paul's web site is: http://www.southernselectsedum.com. Many of the fruits and vegetables that we find in our gardens require pollination by insects to produce the food that we eat and the seed to reproduce the plants. The honey bee is the principal pollinator of these food plants. Honey bees account for about 85 percent of the pollination. The remainder of the task of pollinating our food crops is mostly shared by native solitary bees, bumble bees, and carpenter bees. Other insects, butterflies, moths, bats, and hummingbirds contribute in pollinating as well. The pollination of these food crops occurs as the foraging bees brush against the anthers of the flowers, which contain pollen. The pollen sticks to the hairy body of the bee and is carried to the flower’s stigma, accomplishing pollination. This is a necessary step in the production of foods like squash, apples, watermelons, and strawberries. The pollination of vegetable crops like mustard, kale, onions and garlic is necessary to produce seed to reproduce the next year’s crop. 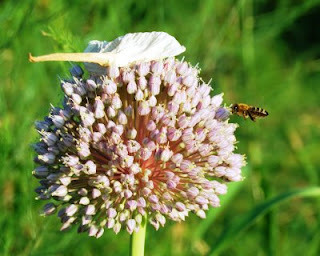 Click on the photo to see a honey bee foraging on the flowers of a garlic plant. The bee is unknowingly pollinating the plant and producing seed. In large areas of the United States, there is a continuing shortage of pollinators. The honey bee’s numbers have been declining for several decades with native bees declining as well. The loss of habitat, extensive use of pesticides and herbicides, and expanded monoculture farming practices have all lead to the decline of pollinators. It is easy for us to turn our backyard vegetable garden into a pollinator garden simply by avoiding overuse of chemicals. A pollinator garden may be a kitchen vegetable garden, a herb garden, a flower garden, a landscape planting, or even a window box or balcony potted plant assortment. The National Academy of Sciences has a most useful web site offering ideas for increasing the important pollinators in your garden. It is located at: http://dels.nas.edu/pollinators/plantsforpollinators.shtml. With 90 food crops dependent upon pollinators, their protection is most important. Our small individual efforts can rapidly make a positive result. Here at Peace Bee Farm we have always made it a practice of working with nature to grow healthy honey bees and produce the finest products possible. It was with a great sense of pride that we established this as one of our guiding principles. Working with nature, however, brings some unexpected twists to running our farm. We didn’t anticipate that we would be delayed in bottling honey for our markets last week due to a fox squirrel shorting out the high-voltage line serving electricity to our honey house. House wrens regularly nest in our wood shop where we assemble bee hives. They are a welcomed sight with a cheerful sound. Today, I shared the shop with an armadillo that wandered into the open door. 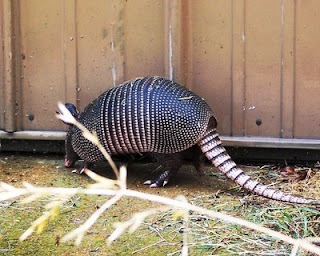 Armadillos, those armored mammals that look like reptiles, entered this part of the Arkansas Delta a few years ago along with invasive fire ants. The fire ants got their name from the fact that their sting burns like fire. None of these creatures should be of great concern over time. They are a distraction for now, however. The reclusive fox squirrels keep their distance, and never before harmed anything. Armadillos may actually be benefiting the bees and beekeepers be eating small hive beetle pupae in the soil, helping break the life cycle of this recently introduced pest. Unless the powerful armadillos burrow under a bee hive stand, we usually ignore them. We have not found a way to accept the stinging fire ants yet. They seem to be replacing the native ants that served to help clean the bee hives and eat some of the bee pests, such as parasitic mites. We continue to work with nature; we know that we are most effective in managing honey bees when we accommodate their natural behavior. Beekeeping is applied honey bee biology. The closer we can mesh with their nature the better we can keep the bees healthy and productive. We welcome native ants in the soil to help control beetle pests and owls in the air to help control mice. We also keep in mind that beekeepers are only part of nature. Nature enriches our life, occasionally humbles us, and sometimes provides us a laugh at ourselves. As far as the fox squirrels and armadillos go, I don’t have any complaints. I haven’t accepted the fire ants yet, though. When you get invited to speak about honey bees and beekeeping for a third-grade audience, you better be well prepared. Children at this age are so inquisitive, and they offer up some of the best questions. Often their questions go straight to the heart of an issue. This was the case with the classes at Campus School on the campus of The University of Memphis. Many of the questions that the eight-year-old students asked me involved the loss of queen bees and queen bee management. Their questions could best be answered by L. L. Langstroth in his mid-1800s writings. Most beekeeping and bee biology writers today don’t dig into the hypothetical questions as deeply as some of those bright students at Campus School did. My visit to Campus School was part of the students’ unit of study involving insects and honey bees. I asked them a few questions, and they asked me many. The students were well prepared for my visit. Of course, they all knew the number of segments in and insect’s body, the number of legs, the number of wings of a honey bee, the number of antennae. Those were easy questions for them. They enjoyed my tricking the teachers with a question about the number of eyes honey bees have. The teachers were not aware that there are five: two large compound eyes and three simple eyes on the top of the bee’s head. 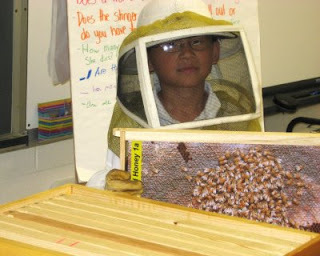 My demonstration was assisted by one of the students, here wearing protective equipment and holding a frame of bees. He smoked the hive and removed the frame with steady hands. No, those are not actual bees; that is a teaching hive with photographs of bees. I feel like both the students and the beekeeper learned about bees with this visit. Crawfordsville, Arkansas, population 606, now has a farmers market on Main Street. The community organization, Hometown Crawfordsville, planned the market as part of their revitalization program. Crawfordsville, like many town across the Arkansas Delta, has been in economic decline for several decades as a result of changes in agricultural practices. The towns have seen both a loss of local commerce as well as a loss of population. The farmers market is designed to be an outlet for local farmers to sell their goods. It also provides the citizens with wholesome foods, social interactions, and educational opportunities. This farmers market, the first such market in the Crittenden County, follows two successful fall festivals held by Hometown Crawfordsville. The farmers market offers fruits and vegetables which are often fresher than those available in grocery stores. The growers also like to bring in a great variety of produce. Pictured are Karen Tims and her daughter, Nicole, from Tims Family Farm of Ripley, Tennessee. 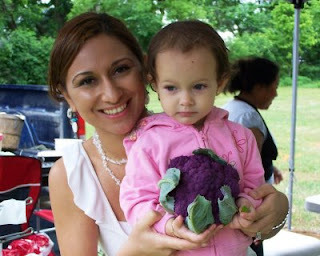 They are holding purple cauliflower that Robert and Karen Tims grew and brought to market. Other vendors at the market bring in prepared foods like jams and jellies, baked goods like cakes, pies, and breads. Peace Bee Farm takes honey and products made from the bee hive to the market. Artisans produce products from wood, pottery, and metal for the market. The farmers market is being well received. Everyone is waiting for those famous Ripley tomatoes to come in. It’s great to see a town attract a crowd larger than its population for a farmers market.